Wooden decks add ample space for outdoor entertaining, but the space between planks provide an opportunity for water to seep through the upper deck to your bottom patio. This drainage can quickly cause a damper in your party and make your deck appear less attractive to guests. Placing a material under the wooden deck allows you to maintain the rustic wooden look of the deck while providing a material that prevents leaking. 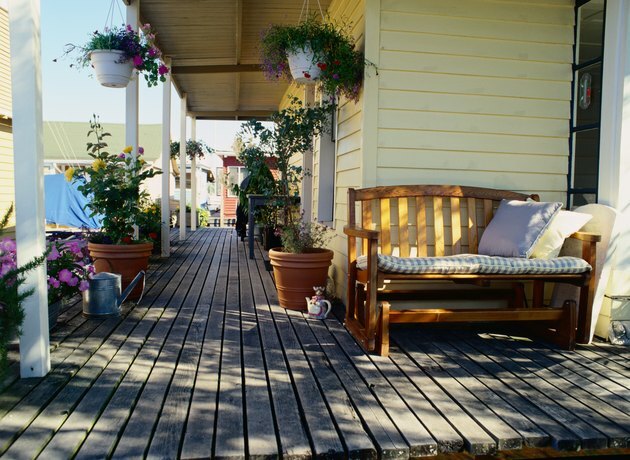 Find out what you can put under your wooden deck to avoid leaking onto the bottom deck. Aluminum provides a structurally-strong under deck system. Current aluminum systems come in multiple colors, so you can match your under deck system with your deck or patio. Aluminum doesn't contract or expand, so it helps to prevent leaking. A vinyl under deck system provides an affordable option. The panels are snapped into place under the second story decking. The materials allows rainwater to collect and drain in an area away from the lower story. It also provides the added benefit of covering the view of the underside of your decking. However, vinyl can contract and expand leading to eventual leaks. It is also not the most sturdy material and is susceptible to damage through prolonged use and storms. Steel panels are another option for your under deck system. Steel systems are not free standing and must be attached with a 24-gauge panel that locks together. It is sturdy enough to sustain the heavy weight of a torrential downpour or snow and ice buildup. Available colors include blue, green, brown and red. A urethane enamel is coated on top of the steel to protect it from rust. Two alternatives are available in lieu of installing an under deck system. You can install a roof to the top of your patio area. Another option is to install a moisture barrier over the deck floor. Or install a waterproof flooring material, such as flooring tiles.